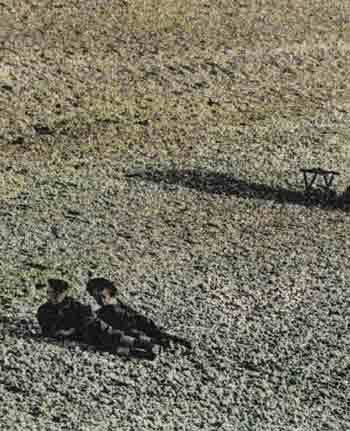 A man in a peaked hat and a boy in a round sailor hat lie on the beach at Cayeux on the northern coast of France, in the lower left of the picture. Toward the upper right a dark or black object, hard to decipher, casts a shadow. The rest is beach, possibly sand, perhaps with stones. The surface is a motley of color‹orange, yellow, green, blue, red, black -- as in a pointillist painting, but the colors don't correspond with the colors we would expect. In fact, nothing is truly identifiable, though the scene is recognizable, primarily because of the two human figures. But we don't know anything about their expressions, nor the makeup of the beach, nor the black object. Were it not for the two figures, nothing would register in our minds except the overall patterns. With them, a great deal registers, especially emotionally: the figures themselves, their relative ages and possible relationship, the expanse of beach, time of day, time of year, time, the past, what we might remember about such scenes in summer. The granular makeup of the field is an essential definition of substance, a field in which shadow has as much substance as people and sand. 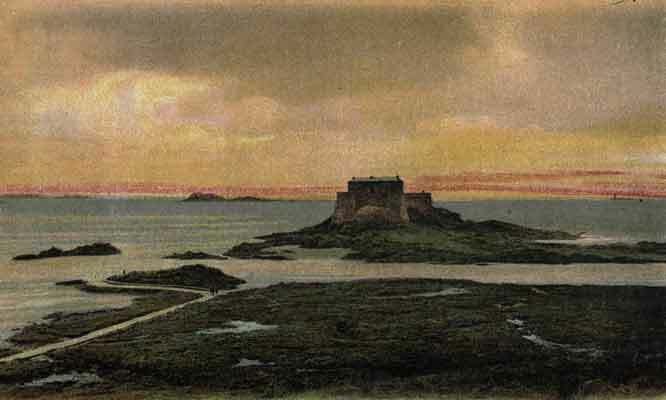 140 Saint Malo contains another layer of time, in the medieval fortress that appears at the picture's exact center. The view is out to sea, and moves from the darkness of the earth below to the lighter blue of the water to the even brighter sky, a saturated orange with yellow and gray and a red strip across the full width of the horizon. The fortress connects and emerges from and into these zones as a silhouette against nature‹against brown, blue, red, and orange‹and tiny figures of people can be seen approaching the structure and the sea diagonally from the lower left on a path that in its texture and coloration seems connected to an inlet of water. It is a place of strange destinations and contradictions where the fortress seems to hold some secret at the focus of land, water, and sky. Actually, 240 Biarritz may be the most elemental of these photos, except that we do know immediately that it is the sea crashing and taking up most of the picture with its great plume of water. It is, however, the most immediately real and the most completely abstract of Esser's works. This crashing is yet another form of atomization, now violently matching the fragmentation of color. 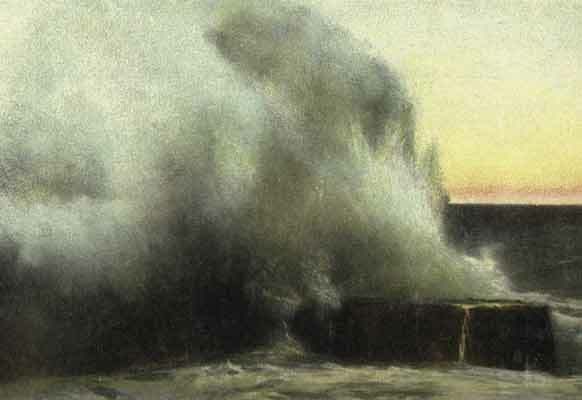 The spray, with its green, blue, yellow, pink, and black dots are cast across the dark sea and the red, yellow, and blue blotched sky that is still seen at the right, blocking our vision. By photographing photographs, and allowing them, or helping them appropriate surfaces in the most visceral way, Esser invites the past to consume the present, just as our own pasts, and the larger historical past, consumes our lives. The earth normally appears a neutral place, as we look at it, though it has experienced more than can ever be accounted for, between what was and what is. All the places depicted in these photos, derived from postcards that I presume date from the late 19th century, are on the northern and western coasts of France, facing the English Channel and the Atlantic Ocean, for Europeans once, and perhaps still, the edge of the world.